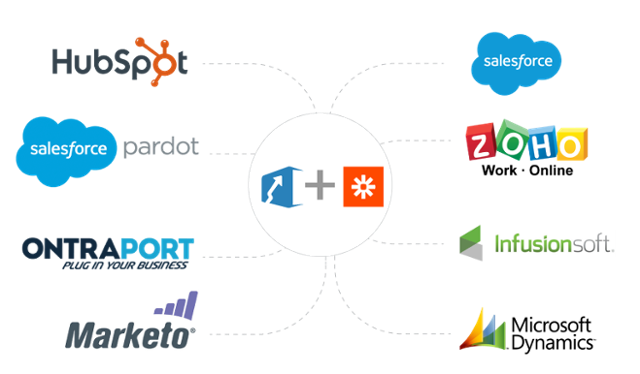 Zapier gives you the power and freedom to integrate Inside Sales Box with Marketing Automation Software, CRM’s and 500+ other apps of your choice without having to write a single line of code. Essentially, a Zap is an integration module between two systems. It listens for a trigger in System 1 and performance an action in return in System 2. The web platform can be used to effortlessly export/import data from Inside Sales Box to any other third part web services or tools. You may either create your own Inside Sales Box Integration or use customer integration module (a Zap) to pass the contact details from marketing automation platforms or inside sales CRM. To save time, you can start with the most popular Zaps used by our customers. Marketing automation tools have made the tedious task of generating, managing and nurturing leads very simple. However, high lead hand-off time from Marketing to Sales is adversely affecting Leads to Closure rate for businesses. This issue is adeptly addressed by integrating marketing automation platforms like HubSpot, Ontraport, Pardot etc. with the assistance of Zapier. Combine the power of inside sales software with CRMs like Salesforce, Zoho, etc to enhance the productivity of your inside sales team. It is big a challenge to sync up the task and workflow of inside sales and sales teams. Zaps can help businesses simplify complex processes. Create Salesforce tasks when you call a lead on Inside Sales Box. Today, Marketing and Sales Teams cannot work in silos. To not miss out on crucial data or lose opportunity collaboration between both teams is essential. Inside Sales Box will help you achieve that goal, all thanks to Zapier Integration. Requisite Zaps ensure a 360 degree integration between various marketing automation tools and inside sales CRM. You can create multiple actions on a single trigger for completing end-to-end workflows. For example, a new lead created in HubSpot(Trigger) is pushed to (Action 1)Inside Sales Box sending (Action 2)Notification to the phone. Multiple actions with a single trigger reduces efforts, maximizes productivity. Zap enables you to search for leads within the system. For instance, a new lead is pushed from Salesforce into Inside Sales Box can be looked up through the search option. If the contact is not found, the lead/contact is created into Inside Sales Box. So why waste your time on manual efforts? Zapier automates everything for you. Be it a two way sync with a Marketing Automation tool, a CRM , Wufoo Forms, Google Sheets , Mailchimp or other 500+ apps, Zapier is an all in one tool. Save Effort! Save Time! Maximize Productivity!